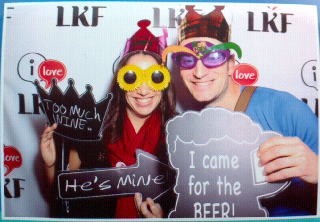 SummerChasers Stories: Lan Kwai Fong - we love this place! 5:20pm on Sunday, touchdown in HK! We're getting to be pros at this now - I even remembered the bank machine at the airport that lets you withdraw a higher limit. And with our experience from last time with the airport-hotel shuttles, we easily sailed into the city (which was surprisingly dark already) gazing at the lights of the skyscrapers. Stepping out of the shuttle bus I immediately smell the familiar scent of the place - something like humid fried noodles, followed shortly by that sweet lemongrass scent that Holiday Inns in Asia manage to all smell like. We're located in Sheung Wan and only a 10 minute walk to our favourite party place Lan Kwai, a concentrated block of restaurants and bars. This weekend they were hosting their own version of Carnival. The narrow streets were even more crowded with tourists and locals crammed in between small booths on the side of the street selling beers, sangria and rum punch, plus an assortment of food. Suddenly we spotted a dense crowd blocking the street. Getting there all we could see was what we could view on people's camera/phone screens in front of us. 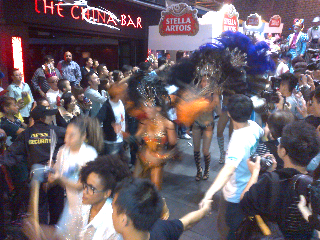 But then the drums started and feathers bobbed above the crowd and there we were - in the midst of a Carnival parade! Guessing that they'd be coming round the block in a while, we ventured off the other way and got a nice big glass of sangria in time to see the parade come by. Drums banging, whistles blowing! It was pretty fun! For some reason, after the parade passed by, we became photo subjects - must be Julie's Latino looks?